This is a bit of a lame post. Pretty much a copy and paste job. But I’ve never been to this event in the years I’ve been here so I don’t have much to say about it. But I like the idea behind it. Recycling old stuff and reinventing it into art and designer objects. Artistic recycling. The event is held at the Centre of Contemporary Culture of Barcelona (CCCB) and surrounding spaces between Friday Oct 5th (today) and Sunday October 14th. 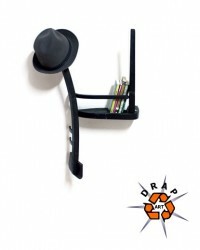 Drap-Art is a showcase of the trends in art that make use of objets trouvés and waste materials as a resource. It is a platform for emerging artists and designers around the world, who use trash as raw material, it is a forum for discussion of theories and urban utopias. Drap-Art is a meeting place for specialists with a public in search of alternatives, in a world that seems to be doomed to destruction. So this year I’m going to make a special effort to get along to it. There’s a Drap-Art Boutique where you can buy things too. Though the prices may be a bit steep for us mere mortals. You can check out the programme of activities to work out what you’d like to see. Or use the links below for other information and to be kept up to date. Though I’m afraid their internet presence is woeful to say the least. The main website seems to be the only thing that’s kept up to date.